Fireworks being let off on a Lake Ontario beach in celebration of the 4th of July holiday in the United States. Nikon D70/18-200VR, 19.2s, f/11, ISO 200, EV +0.3, 18mm focal length, tripod. Considering fireworks are illegal in New York state of anybody but licensed companies to have, handle and present, I saw an unending and very impressive fireworks display all along the eastern Lake Ontario shore last night. People brought down boxes full of fireworks and let them off. Hundreds of people who had come down to watch applauded as groups out did themselves. 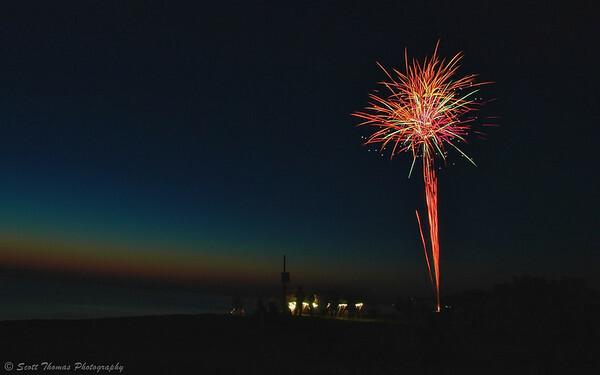 This entry was posted in Weekly View and tagged 18-200mm vr, 4th of july, beach, fireworks, holiday, lake, Lake Ontario, new york, nikon D70, Photography, sunset, water. Bookmark the permalink. Ooooh, Aaaaah, Beautiful! Amazing that you captured so much color. I’m curious to know your camera settings. Whoops…forget to add the information, Deanna. Thanks for the reminder! Pretty fireflower! We didn’t go to see fireworks, as Miss Sadie, the Cowboy and I are not fond of loud booming noises. It’s fun to see them here, without benefit of sound! I glad I could bring some silent fireworks to your holiday, Gerry. It looks like a flower. Your settings are interesting, – I wonder: did all the colors come out at the same time, or is it your time setting that has made this firework extra colorful? It´s realy nice. Birgitte, the colors came a series of different colored fireworks being let off one right after the other. After I got about 3 or 4 of them, I tripped the shutter closed. WOW!!! I really love this! The last bit of the sunset is just beautiful, but doesn’t compete with the fireworks. No, the sky doesn’t compete with the fireworks but complement it to fill the frame. I could have cropped it out but it was so pretty and exactly what I was after. Gorgeous! I love how you can see the trail leading up to the “pow” in addition to the “pow” itself! I’m trying to be a sponge, sucking up all the information I get from you and the many wonderful blogs I’ve discovered through your site. Remote control could be one of the differences in the two cameras I’m considering! I’ll have to check it out. Please, let me know when you do. I bet you’d do great. I might try a one shot HDR on this image to see what it looks like. Lovely! Yeah, the ‘fireworks are illegal’ rule seems to get lifted on the fourth around here as well. We walked to the local beach to catch the fireworks across the water and also saw some rebels shooting a few of their own away from the crowds. We had incredible weather and it was a beautiful night. Is this really a 19.2s exposure?? That seems extremely long. Perhaps you meant 9.2s? Beautiful Scott. I hope you had a wonderful Fourth of July. I had a very good Fourth of July, Amy. Thank you! Looks better than the real thing. 🙂 I attempted one myself but didn’t do a good job. This is one of the best firework photos I have ever seen. Thanks for giving details of the camera setting, I have made a note of them.